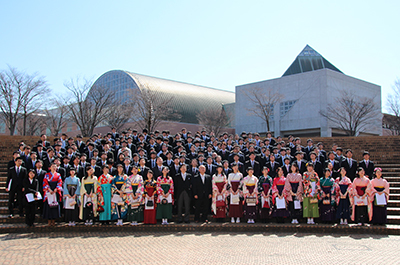 On March 20, 2019 (Wed), the degree conferment ceremony for AY2018 was held at the University of Aizu auditorium. 252 individuals, including 188 students graduating from the Undergraduate School of Computer Science and Engineering, 59 students completing the Master's Program, Five students completing the Doctoral program, were conferred with degrees that will help them contribute to society in their own way. 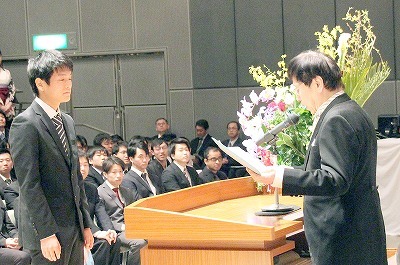 Following congratulatory addresses by the Governor of Fukushima and Aizuwakamatsu City Mayor, current students who have shown superior academic performance and research results were presented with awards. Undergraduate Representative Tatsuya Ona stated his reply address. I'm sure that the knowledge and skills we acquired at this university will help us overcome these tough times, Further, I will continue making an effort to contribute to the local and international society in the future. 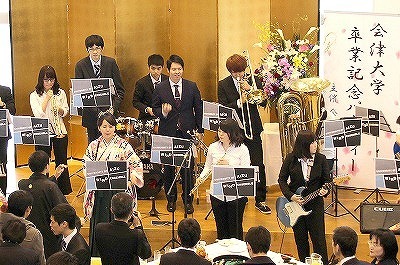 After the conferment ceremony, commemorative photos were taken, diplomas were presented to each student, and a UoA Supporters Association-sponsored Graduation Party was held at the UoA cafeteria. 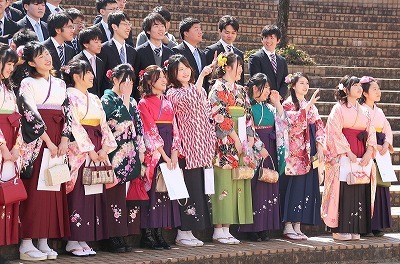 At this party, which symbolizes the end of student life for most of these students, participants enjoyed pleasant conversation and taking commemorative photos. With the days of snow finally leaving Aizu behind, we await the imminent arrival of spring. 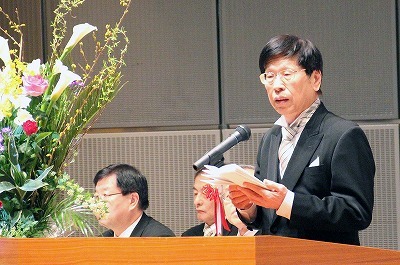 Even greater than my pleasure in welcoming the arrival of spring is my pleasure seeing you gathered here today at this Degree Conferment Ceremony. On this day, 188 undergraduate students, 56 Master's students, and 5 Doctoral students will be receiving their hard-earned degrees, for which I offer my heartfelt congratulations. 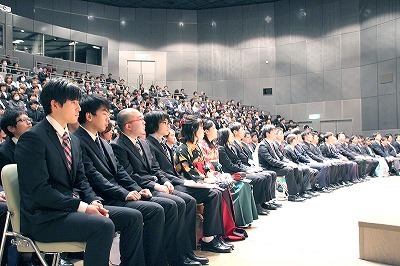 Today, we are joined by honored guests including the Governor of Fukushima Prefecture and the Mayor of Aizu-Wakamatsu City, who have come here to celebrate your graduations along with myself and the members of the faculty and administrative staff. However, no one could be happier on this long-awaited day than the friends and family who have supported each of you graduating students for all these years. On behalf of the university, please allow me to express my deepest gratitude to all these family members, friends, and supporters. Each of you graduating today has chosen to either join the work force or advance to graduate school. But what sort of era awaits you? In the fields of technology, society, and economy, both Japan and the world at large are entering an era of instability and change. For example, technologies such as AI, robotics, big data, and blockchain are steadily advancing, which some predict will completely change the way we work. Furthermore, the battle for high-tech supremacy is now taking place. In times like these, you will be expected to become first-class not only by the standards of Japan, but on an international level. 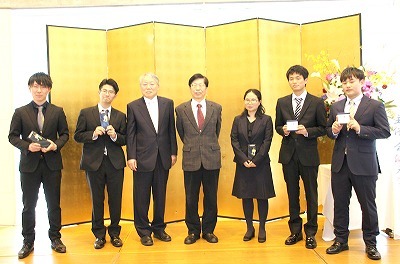 Those of you who have mastered information and computer technology at the UoA will be expected to demonstrate the creativity needed to create methods and systems for fighting problems such as Japan's changing demographics. That said, aim to achieve tiny successes instead of aiming for a grandiose success from the beginning. Once you are little more confident, aim to achieve another small success. If you repeat this long enough, you will eventually discover just how high you have climbed without realizing. When that happens, I hope that you will realize and experience the fact that no matter how great an innovation is, most of the components at its core are ordinary, simple technologies. I also think that you will realize that, opportunities to innovate are available to everyone, the same way that sunlight shines on all of us. The basic skills you learned at the university will give you the feel for the terrain that you will need in such activities. Many days of epic struggle await you. Your true ability and capacity will be judged by the path you take when you cannot see the way forward. If occasion requires you to take a roundabout path, I suggest that, from time to time, you do so without hesitation. It has been eight years since the Great East Japan Earthquake of 2011. Fukushima and Japan are still in the course of recovery. I have high hopes that all of you, regardless of where in Japan you are, will participate in, and contribute to this revitalization as computer scientists and engineers. In closing, please allow me to once again congratulate you all on your graduations and to wish you success in your chosen career paths.